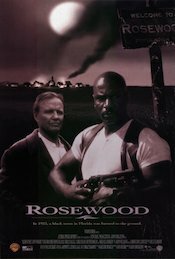 Boyz N the Hood director John Singleton’s 1997 retelling of the tragic 1923 attack by a white mob on the black community of Rosewood, Florida finds Ving Rhames, Don Cheadle and Jon Voight brought together in common purpose to help save the town’s residents. A dynamic blend of orchestral sections with blues instrumentation such as banjo and harmonica, create a rural and intriguing mood. A bluesy harmonica plays atop of a deftly played acoustic guitar, with light strings, banjo, and a mouth harp adding an atmospheric feel. Opens with a searching feel from a French horn, then 12 string guitar leads into a mood of wonder and discovery with an orchestral soundscape. An acoustic guitar plays with intent feeling, then joined at 1:50 by light strings and flute. A dynamic and moving feel is produced by an airy orchestral soundscape. Ends with a ominous, building tone of danger. A breezy full orchestral sound fluctuates between peacefulness and soothing sections, with devious and threatening moods. An expressive and threatening orchestra builds in intensity, creating a worrisome atmosphere. An ominous tone is created by a sneaky orchestral sound. Shifts at 1:58, becoming racing and dangerous with driving acoustic guitars. A blend of orchestral and folk instrumentation, creates a suspenseful and brooding mood. A subtle, yet threatening orchestra creates a devious and menacing mood. Dark and somber tones are produced by a stirring orchestral sound. A lighthearted orchestral sound creates a hopeful and sweet mood. Shifts at 1:19 to a playful guitar and harmonica driven tone. A dark orchestra builds tension and creates an energetically fearsome tone, with low percussive hits. Opens with a blend of folk and classical instrumentation, creating a mood of wonder. Tension builds at 0:45 with a piano driving an orchestral sound. Opens with a ponderous french horn solo playing over rich deep strings. Builds into a full orchestral sound, producing a stirring and determined mood. Tense strings and brass create a moody and daunting atmosphere. Quickens pace at 2:14, becoming hopeful before retreating back into intrigue. An expressive orchestral soundscape creates a dynamic interchanging feel from dangerous atmospheres to hopefulness. Opens with cautious yet inquiring strings, creating a mood of dangerous wonderment with a rich orchestral sound and guitar. Eager acoustic guitars and a mouth harp create an unusual and alert atmosphere. Brooding tones are produced by a devious sounding orchestra with building tension and fear. Brass and strings create a menacing and fearful atmosphere. Opens with sinister percussion hits before a wistful sounding orchestra creates a sweeping tone of determination. A solo piano opens, then is joined by light strings, guitar, and trumpet producing a stilted and searching mood. Piano and sweeping strings blend with an animated acoustic guitar, creating a lively and challenging mood. A rich mixed choir sing gospel and religious inspired words, creating a promising mood. Strings drive an eager atmosphere with a soundscape of racing acoustic guitars and a mouth harp. Deep strings and brass set a thoughtful and reproachful mood. At 1:24, a violin plays searchingly over an orchestral soundscape, creating a morose feeling. A reassuring and inspiring mood is created by a mixed choir singing gospel and religious words. Opens with a solo acoustic guitar, playing soulfully. At 1:38 an orchestral soundscape builds creating a ominous and fretful tone. Opens with a soulful female voice, singing in gospel style then foreboding strings creep in and a full orchestral soundscape builds tension and menace. A stirring piano plays over an orchestral soundscape, creating a dynamic mood of soothing uncertainty. Soulful harmonica and acoustic guitar open, then joined by orchestral strings, mouth harp, and light banjo, creating a rural and intriguing mood. Intense drums hit behind a female gospel singer. A looming and menacing orchestra sound builds, creating a feeling of hopelessness and despair. A heartfelt orchestral sound creates a pleasant, easy listening and flowing mood. A mixed choir sings a religious and gospel inspired song, creating an encouraging and powerful mood. An acoustic guitar and an orchestral soundscape build, creating an ominous and worrisome mood. A large sweeping orchestral sound creates an optimistic and proud mood. Opens with a soulful gospel choir. At 2:05 a large, sweeping orchestral sound creates an ever more hopeful mood.